"The walls are of the date of the old Monastery; alterations by the Duke of Norfolk are marked by a date in the brickwork. 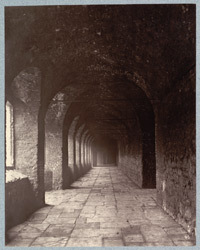 Mr. Roper gives an engraving of an ancient doorway, since destroyed, opening on to the Cloisters." Letterpress by Alfrd Marks from 'Photographs of Old London'.